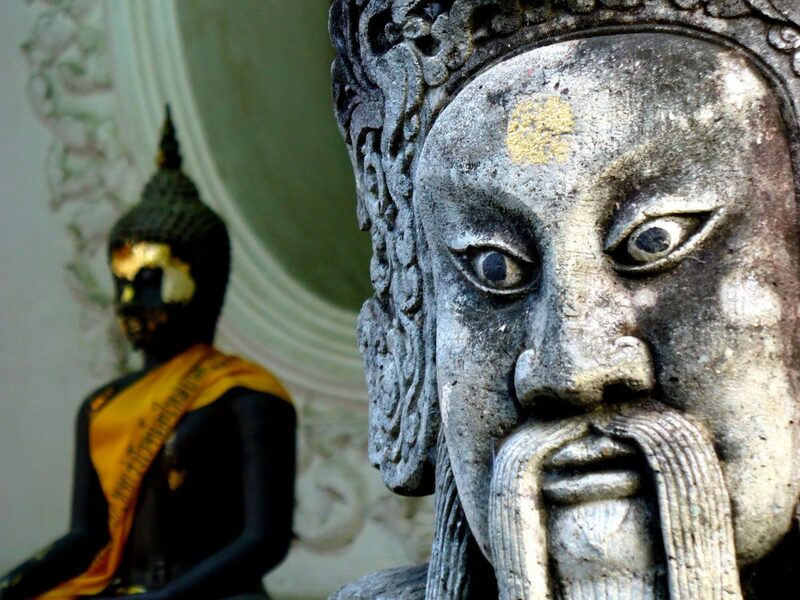 Just 50 minutes outside of Bangkok, and a couple hours drive from many other tourist destinations in southern and central Thailand, sits the small and welcoming city of Nakhom Chai. Nakhom Chai is a town with no shortage of good eats! Aside from the plentiful street-side noodle stands and restaurants, Nakhom Chai is also home to the famous local Thana Market. Thana market sits on the banks of the Jeen River, and is packed full of vendors selling fresh foods. 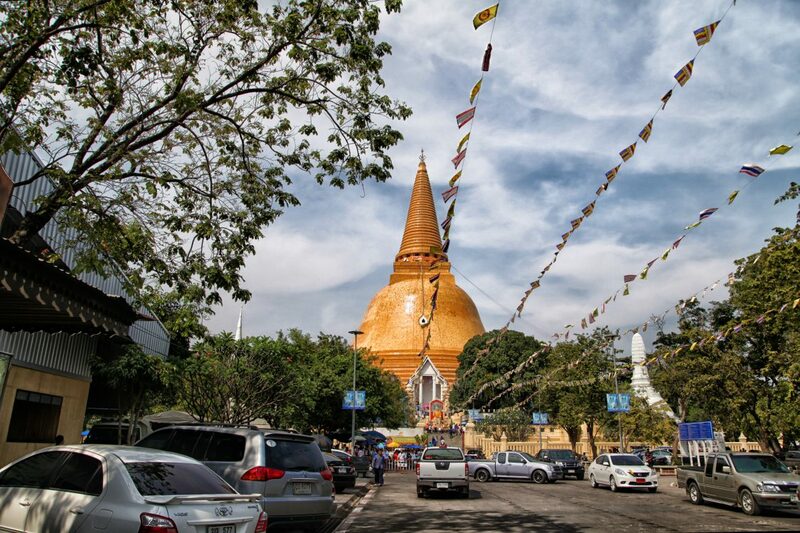 Although Nakhom Chai is far from a tourist hub, there are a couple of attractions worth mentioning, which include a vintage car exhibit, Wat Bang Phra—a temple famous for the ancient Sak Yant monk tattoo, an orchid farm, and a host of other visit-worthy quirks. Here is a great webpage that has more information about tourism in Nakhom Chai. Check out what some of our past teachers have said about their experiences teaching in Nakhom Chai. Nicole: It is tiny but also really close to Nakhom Pathom and Bangkok. The school has been amazing, and all the Thai teachers are very welcoming. It has been pretty easy to make Thai friends. Amanda: We are located in the Nakhon Pathom Province which has a lot of Thai History. It houses Wat Phra Pathom Chedi which is the the world’s largest stupa. Nicole: There are many great places to eat here, but I usually go to this one place that sells stir fried vegetables. The owners are lovely, and always very excited when I show up. They have been teaching me a little bit of Thai every time I eat there. Amanda: Across the street from my apartment there is a little cafe that has delicious spaghetti that reminds me of home, and then lining the street there are many different restaurants and street vendors to find quick and cheap Thai food. Nicole: I have 5 sets of stairs at home that I run up and down twice a week. My school also hosts a taekwondo class, and teachers are invited to join in with the kids twice a week. I travel to Nakhom Pathom to go to the Palace to run because it’s beautiful there. I also have a gym membership at Nakhom Pathom, which was around 300 baht for the year! There is also pool where you can do laps in Nakhom Pathom . Amanda: There is a zumba style class outside of Tesco at 6pm. I also just walk around the town, or make an extra trip to the store for water since I live on the 4th floor, and there’s no elevator. Nicole: Downstairs from my apartment I have a local shop that sells literally everything you could ever need. There is also a Tesco up the road. Amanda: There is a mall 15 minutes away by going to the van station next to Tesco. Nicole: My school gave me a bicycle that I ride that to school every day. When I go to Nakhom Pathom I catch a bus. I was going to get a motorbike but there has been no need. Nicole: It’s a one-bedroom apartment. There’s no elevator or hot water, but I love it. All the English teachers are on the same floor, so we see each other outside of school all the time. Amanda: Since we are so close to Bangkok it’s really easy to go there on the weekends for a day trip or to stay in a hostel. I usually meet up with others from orientation on the weekends. I usually go on a weekend trip 3 times a month with friends I made in the group and I have gone with other western co-workers. Nicole: I go for bike rides, exercise, learn new skills, practice ukulele, and study Thai language. Nicole: I go to Bangkok, go camping, and hang out with the other English teachers. I go to the gym in Nakhom Pathom on weekends often, and it always turns into a day trip because all the locals want to talk to you, and sometimes even take you out for lunch. Nicole: Erawan waterfall is about 2 hours away, but definitely doable over a weekend. The waterfalls are just outside Kanchanaburi town, which has a whole lot of other attractions in it as well. Nicole: You will suffer from culture shock. Hardly anyone speaks English, and if they do, it is very broken English. At first it may seem like there is nothing to do in your town, but you will find things to do if you give it time. Get out of town every other weekend, and go and explore.